Bespoke fork truck attachment for Houghton International Inc.
St Clare Engineering Ltd, the only worldwide manufacturer of the Grab-O-Matic range of drum handling fork truck attachments, have developed for Houghton International Inc. a bespoke quick attach/release system and shortened unit that improves safety, manoeuvrability and drum protection. 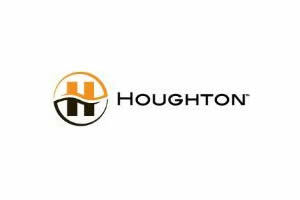 As one of the world’s leading manufacturers and suppliers of engineering fluids and lubricants, Houghton International Inc. lift and move thousands of drums a week at their Manchester plant. There was a need to reduce the overall length of the fork truck attachment units to enable the trucks to turn easily between the storage racks. In addition there was a requirement for a secure system to attach and then release the drum handling units from the forks, and the need to eliminate the creation of dents and scratches at the base of the drums. Following a site visit to assess Houghton International’s needs and requirements, St Clare Engineering produced a written report outlining their recommended solutions. A customised fork lift attachment was then manufactured in which the pillars (drum supports) were moved back on top of the fork pockets, 150mm wide webbing drum supports were fitted to cushion the drums and the Quick Release System was fitted to the frames. The end result was the Grab-O-Matic QR-2-DLR-WP. Lee Draper, Operations Manager at Houghton International Inc. said that since upgrading their Grab-O-Matic fork attachment to the Grab-O-Matic QR-2-DLR-WP, both safety and efficiency has increased. After the success of the first 2 units purchased, Houghton International invested in 3 more Grab-O-Matic attachments; a Crane Hoist Attachment (model QR-SC-1), an Automatic Scissor Grip Drum Handler (model SG-1) and a Fork Attachment Drum Rotation Unit (model SC10), for dispensing the contents of a drum in a controlled manner. Houghton Global has also recently purchased 5 units for a similar operation in Spain based on the successful project in Manchester.